This week’s Sunday Digest features must-read digital comics from Neil Gaiman and Knockabout Comics with charity graphic novel Neil Gaiman’s Lost Tales on the Sequential iPad app, Jamal Igle’s pre-teen/Guided View superhero adventure Molly Danger, Kieron Gillen and Jamie McKelvie’s groundbreaking Phonogram, plus another offering from ‘Down Under’ with The Deep: Here Be Dragons from Gestalt Comics in Australia. It’s an exciting time to be a Neil Gaiman fan, not only is there going to be new issue of Sandman coming out soon, but his forgotten classic Miracleman is being re-issued in January. 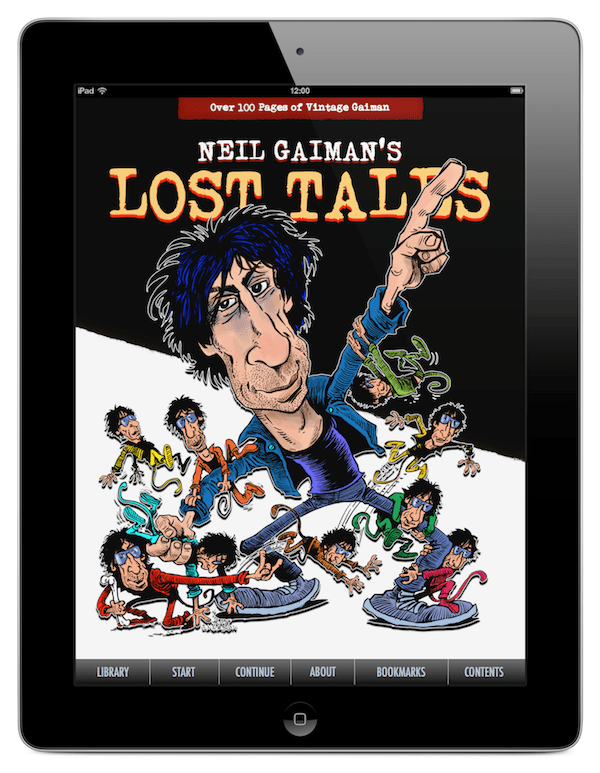 But if you can’t wait until then be sure to check out Neil Gaiman’s Lost Tales on the Sequential app this weekend which reprints some of earliest work in comics and will see money donated to the Malaroa No Zmore UK charity for every issue downloaded. The Lost Tales features 13 tales from his early years in comics, including all of his offerings from the controversial Outrageous Tales from the Old Testament and Seven Deadly Sins which features a couple of incredible collaborations which the legendary Bryan Talbot as well as an early team up with Dave McKean who would go on to create all the covers for the Sandman. Even at this stage you can see Gaimans satirical views on religion and themes like immortality and spirituality coming through in his work, even if they are a little tough around the edges compared to his later, more polished masterpieces. Alongside these early classics is an interview he conducted in 1988 and some production notes on the Sandman, as well as bonus material such as covers and sketches, all of which make this an absolute must for any Gaiman fan – plus don’t forget you’re helping world a little bit too! After the all out action of issue 1, its time for circumspection and exposition in this second outing for Jamal Igle’s pre-teen superhero. With Dr Medula safely locked away its up to D.A.R.T. to deal with the fall out from the super mech attack both logistically and emotionally. As Molly attempts to deal with the dichotomy of being a 10 year old superhero who’s been saving the city of Coopersville for 10 years it raises more questions than her handlers have answers for. 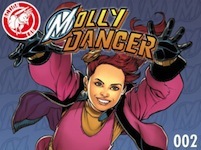 With this humanising of Molly’s condition it gives the book much more of an emotive heart than you might expect and it’s this kind of depth that makes Molly Danger more than just another teen super hero book. Backed up with its slick use of Guided View and stylish artwork from superhero veteran Igle, Molly Danger has so much more depth and substance in its story telling than Marvel’s recent Infinite output or DC’s DC2 Interactive titles and shows that digital comics can be about so much than spectacle. By mixing pathos and heart with a smart exciting superhero story that uses the technology to improve it’s story-telling, this it is a book that is perfect for all ages and is up there at the very top of the Guided View hierarchy when it comes to innovation, readability and most important of all – fun. Last week we reviewed Gestalt Comics‘ post-modern super villain story Unmasked in the Sunday Digest and this week we’re checking out another title from the Aussie graphic novel company, in the shape of underwater family adventure book, The Deep: Here Be Dragons. 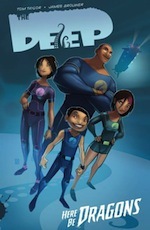 At the complete opposite end of the comics spectrum from Unmasked, The Deep is an all ages action adventure book which mixes Swiss Family Robinson with Seaquest DSV to create the kind of underwater explorer tales that kids of all ages should just love. It’s loads of fun with a plot revolving around the Nekton family and their search for a mysterious underwater leviathan who appears every 55 years and terrorises Greenland. Writer Tom Taylor keeps the tone light and fun with the story zipping along at a good pace for all three issues of this mini-series, while James Brouwer’s cartoony art has an almost Disney-like quality to it, which brings every page to life – even if that page involves a decapitated whale or a terrifying sea monster! Although there is a slightly confusing leap in the narrative between issues 1 and 2 this is still a really great read and is the kind book that really deserves some mainstream success.